If you or a loved one are in crisis and dealing with homelessness or hunger, The Rescue Mission can help. Life House offers free meals to the public at 7 a.m., 12 p.m. and 5 p.m. daily. All who are in need are welcome to join us. The Life House offers immediate, emergency shelter for men in a homeless crisis with a medical clinic available. We are here to help. The Restoration House offers short and long-term housing for men in a homeless crisis. The Charis House offers short and long-term housing for women and children in a homeless crisis. To read more about check-in requirements and the programs offered through these ministries, please visit each House’s section. 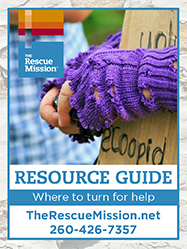 Download a copy of our Rescue Resource Guide here for community agencies who help the hungry and homeless. For those who need mental healing.